I believe that everyone in the world should have access to clean water. It is for this reason that I volunteered with the nonprofit organization Wine To Water. Over the past ten years, this non-government organization has provided over 500,000 people with daily access to clean water. Wine To Water was started in 2004 by Doc Hendley, a bartender from North Carolina. Doc was nominated as a CNN Hero of the Year in 2009. Read more about Doc here. In 2015, Nepal was hit by a devastating earthquake that killed thousands of people. Professors at Appalachian State University with close connections to the region contacted Wine To Water and asked for help. Wine To Water has been on the ground in Nepal since that call, and it is here where I volunteered for two weeks to help bring clean water to these people. A group of 18 volunteers ranging in age from 18 to over 50 (I was the over 50) helped with a water project in the town of Dahakhani in an area near the foothills of the Chitwan Jungle. The town has 160 families with a population approaching 1,000. Villagers must travel a great distance to reach an existing water system which is nothing more than a concrete slab where a gravity fed water pipe can be turned on. This water then has to be carried back to the village to feed animals, water crops, cook, clean etc. The project my group started will collect water from a natural mountain spring located approximately two miles up the foothills from the town center. We split into two groups, and my group started work on the water collection dam. We excavated and built a rock and concrete dam that will collect the water that will be gravity piped to the village of Dahakhani. The second half of our group excavated a sedimentation tank on the side of a cliff that will allow the water to pause for one hour before it travels to the reserve tank closer to the village; any sediment from the water will collect at the bottom of the tank. This system will provide year round water to the village at the rate of .75 liters of water per second. There will be a 20k liter holding tank to store the water and the access will increase from nine points of access to 34 points of access or about one source of water for every five dwellings. Homes in Dahakhani do not have running water or water in the latrines. The school, with over 200 children, has three latrines and no water access. The children have no water to wash their hands. I was told that over 80 percent of illness in Nepal could be eliminated with clean water for proper hand washing and hygiene. We worked shoulder to shoulder with those from the village, clearing rocks with pick axes and crushing rocks too large to move with a sledge hammer, mixing cement and laying the foundation for the dam. One particularly impactful event occurred carrying all of the sand and concrete up the mountain. It took me an hour to cover this distance with nothing more than my backpack and water bottles. Yet, it was the village women who transported the sand and gravel up the steep incline in flip flops for shoes. These bags of concrete weighed as much as 50 KG or 110 pounds. 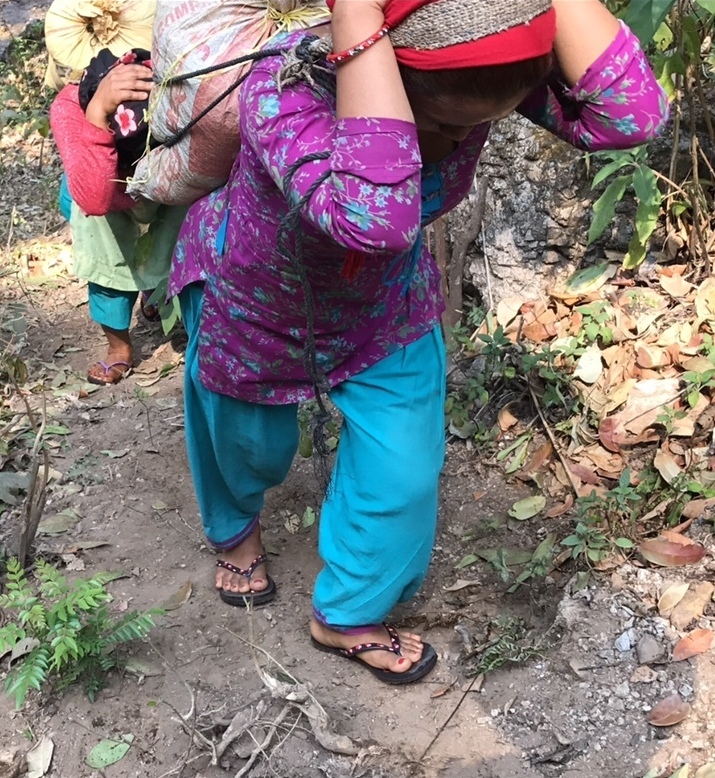 I would not be able to carry what amounted to my body weight across rock stream beds and steep inclines, and yet, these women did it repeatedly. The families in Dahakhani have left a lasting impression. Their greeting and welcome ceremony when we first arrived was heartfelt and emotional. We take for granted the fact that water is just a turn of a faucet for both hot and cold running water. This month National Geographic reported that everyday women and children spend a collective 125 millions hours gathering water. Imagine how life would change if you had to walk over an hour to collect your water for the day. Water weighs 7 pounds per gallon. This must be why the women in Dahakhani are capable of carrying heavy loads on their backs; it is literally back breaking work. It was rewarding to work with the Nepalese and it was fun to work with the younger volunteers from Wine To Water. I feel that we put a small drop in the bucket to help the men, women and children near the foothills in Southern Nepal. There is no life without water.